Science teaches us not to answer questions in black and white terms—the meaning of data usually has many shades of gray. So it is with figuring out the micro and macro effects that different roof coverings might have on global warming or energy efficiency. The answers are starting to look more complex, and more promising, than ever. Assessing the indoor and outdoor climatic benefits of roofs with mixed cover. While addition of photovoltaic panels above a roof provides an obvious energy generation benefit, it is important to note that such systems – whether integrated into the building envelope, or mounted above the roof – can also result in an increase of convective heat flux into the urban environment. 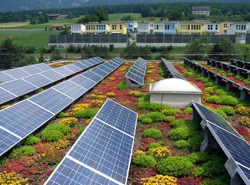 Our analysis shows that integration of green roofs with photovoltaic panels can partially offset this undesirable side effect, while producing additional benefits. This neither-black-nor-white-nor-all-green approach to dealing with surface radiation makes sense from both energy and climate warming perspectives, especially given the low sun angles, cold nights, and snow cover in some climates. For instance, a recent paper, in Environmental Research Letters, uses global atmospheric modeling to estimate that boosting albedo by only 0.25 on roofs worldwide—in other words, not a fully “cool” scenario of all white (albedo: 1.0) roofs—can offset about a year’s worth of global carbon emissions. Global space heating increased more than air conditioning decreased, suggesting that end-use energy costs must be considered in evaluating the benefits of white roofs. Delving directly into such costs this week at the AMS meeting is a paper from a team led by Anthony Dominguez of the University of California-San Diego. They looked at the effects of photovoltaic panels on the energy needs in the structure below the roof, not the atmosphere above it. Did they find that a building is easier to keep comfortable when covered by solar panels? Well, if you need to air-condition during the day, yes. If, however, like many people on the East Coast this summer, you need to keep cooling at night, then no. This is science—don’t expect a black-and-white answer.